A German meat producer is using the SuperLift plastic pail from RPC Superfos for its bulk-pack sausages. Metten Fleischwaren chose the bucket for its long shelf-life, easy-handling, and brilliant look, as well as its in-mold labelling oxygen barrier protection. 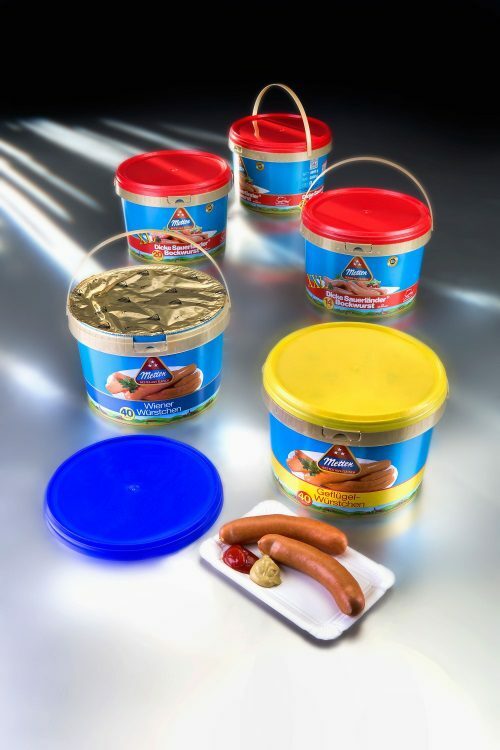 The company is using the 4.6L injection-molded SuperLift polypropylene pail, 226 mm in diameter, for five types of sausages that it sells in bulk consumer packs, including the veal-based bockwurst, Dicke Sauerländer. The pail’s barrier label allows for a nine-month shelf-life at ambient temperatures facilitated by an autoclaving process at high temperatures for 1.5 hours. “The pails look brilliant after autoclaving and, importantly, they not only safeguard the great taste of our sausages – our sausages still make the right cracking sound when you bite into them,” says Tobias Metten, CEO of the family-owned meat producer. The meat producer’s key target groups for the bulk packs are meat wholesalers, canteens and the foodservice industry. While there is no risk of harm when touching the rim of the plastic container, it is also easy to open and re-close. “In professional kitchens where many sausage meals are prepared every day, finished packs tend to take up a lot of working space,” says Metten.